Week of Reflection. Since I’m feeling inspirational today I wanted to talk about one of my favorite non-profit organizations. I donate to a wide variety of charitable organizations, mostly environmental and wildlife. This is one of the only people centered organizations I give to. Why this one? We live in a difficult world, a broken world. We believe that everyone can relate to pain, that all of us live with questions, and all of us get stuck in moments. You need to know that you’re not alone in the places you feel stuck. We all wake to the human condition. We wake to mystery and beauty but also to tragedy and loss. We know that pain is very real. It is our privilege to suggest that hope is real, and that help is real. You need to know that rescue is possible, that freedom is possible. We’re seeing lives change as people get the help they need. People sitting across from a counselor for the first time. People stepping into treatment. In desperate moments, people calling a suicide hotline. We know that the first step to recovery is the hardest to take. We want to say here that it’s worth it, that your life is worth fighting for, that it’s possible to change. The vision is better endings. The vision is people finding life, finding freedom, finding love. The vision is people breaking cycles, making change. That’s straight from their Vision on the site. 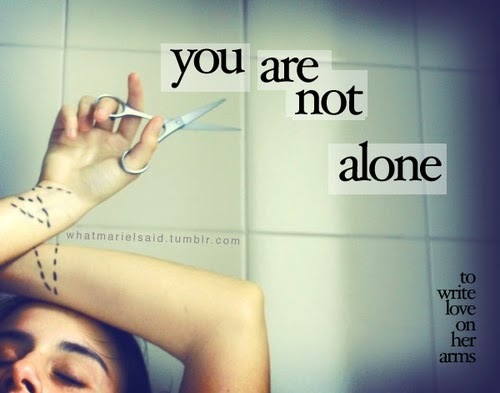 They have some great Facts about Depression, Addiction, Self-Injury, and Suicide as well. 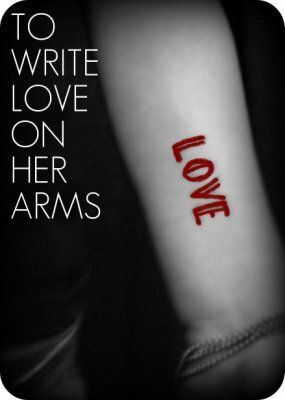 Every year they have a collection of days where they make a request that everyone actually write Love on their arms. Once, twice, as many times as you want. The point is so that people will see it and ask why you have Love written all over. People send pictures of their expression to the site, post them on their social networks, text them to friends, and spread the word. I think this ‘event’ has passed, but that doesn’t mean you can’t still do it whenever you want. It’s a good thing to share, a good message to send. I wanted to let you know. I never cover my scars with this, but I write it between them, above them, around them, over and under my family tattoo. It’s silly but I love it. It should be pretty obvious why I relate to this particular organization, having struggled with and continuing to fight, against all of these issues. While a lot of what I write in this blog is about how tumultuous and sad/angry/hurt I often feel. About the facts, statistics, and issues of Borderline Personality Disorder… My goal is to educate. To understand the label of BPD and see past it, to see the person Beyond the Borderline Personality. In knowledge comes understanding. In understanding comes hope. With hope there is the possibility for a better life. A life worth living.